virtualpolitik: So Many Blogs Get Abandoned Every Year, Why Not This One? So Many Blogs Get Abandoned Every Year, Why Not This One? 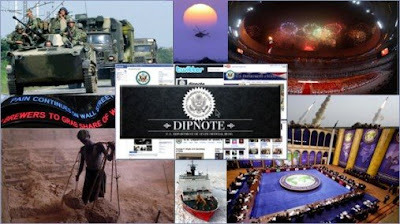 Yes, this is the actual photo collage at Dipnote, the truly unreadable blog from the Department of State, that is celebrating the end of the year with the equivalent of a highlights reel, where they plug their other social media products. The most popular individual entry of the year was "U.S. Department of State and Social Media: Tell Us What You Think" by DipNote's Editor-in-Chief Heath Kern Gibson. I find this particularly encouraging, because it demonstrates that you -- our readers -- are as excited about our efforts as we are. It also gives me an excuse to plug these efforts: follow DipNote on Twitter, become a fan on Facebook and participate in Spokesman Sean McCormack's Briefing 2.0 on the State Department's YouTube Channel. Dipnote has never been a good government blog. Its prose makes the blog of the Transportation Security Administration look lively and compelling by comparison. And, of course, it shows on a daily basis yet again why the British have been doing much better Internet public diplomacy than the Americans, despite comparatively few resources. As I tallied DipNote's 2008 entries, I was consistently impressed with the informed and heartfelt comments that you, our readers, have posted. I was also reminded of how grateful I am to our Department contributors -- for the work they do and for taking the time to share it with us. Next week, I'll highlight some of the entries that I personally found memorable. In the meantime, the DipNote team thanks our readers and contributors for a successful year and wishes all of you a very happy and healthy holiday season.